Optimizing the gameplay of professional players. When I was a teenager, I played World of Warcraft on a professional level. But, very quickly, I realized that the game's UI did not support me in my ability to play well. This was the starting point for me creating iLive user interface; a UI compilation that helps players play better. After two years, and five major releases, it is one of my proudest projects because it made me fell in love with UX. My primary design goal was always asking myself: "How can I make this more simple without losing functionality?" Whenever I released a version, it wouldn't take long before I decided to scrap everything and start working on a new version. For me, it was all about correctly displaying the necessary information at the right time for the player to make the right decision. Kinda like, creating an interface for someone driving a car. It has to feel like an extension of yourself, not something that you simply use. Let me give 3 examples. The changes to the mini-map reveal many of the design thinking processes and design goals with iLive user interface. The baseline mini-map provided by Blizzard is skeuomorphic showing a border made out of metals, and for the new player, it is nice to know where all options are like when you have received mail, accessing the calendar, zooming in and out and so on. But, for the player that has played this game for a longer period, all of this visual information becomes redundant. The changes? All text and icons are removed and have been replaced by integrated functions. For instance, to zoom the user can use their mouse-wheel to zoom in and out. 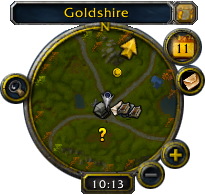 Right-clicking the mini-map opens up search. And in order to see location or time, the player simply hovers the mini-map with their mouse. A unit frame displays information related to individual characters. 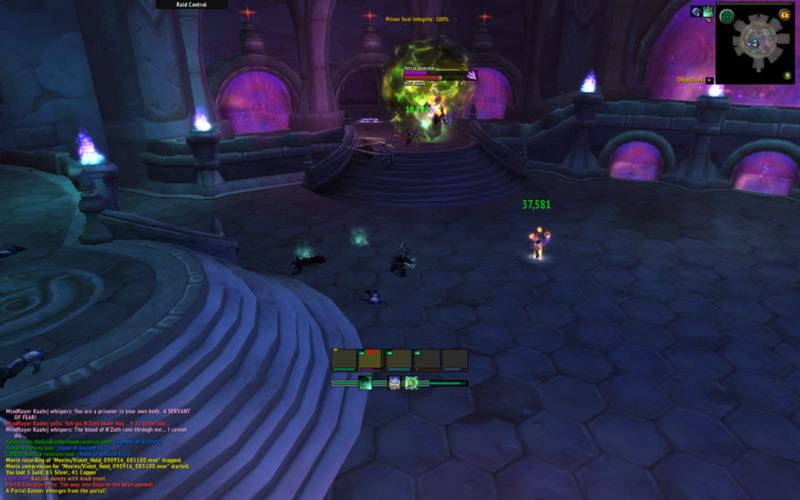 And there's a frame for player, target, target's target, pet, focus target, bosses, raid, party and so on! Below you'll find my progress with all the versions I released for the player frame. Notice how as the slide changes how less information is put on the frame. E.g. portrait is removed, or fixed numbers. As you play the game, you start noticing what is important to display and what is not. If just you'd know how much time I'd sit in front these frames and reiterate. Although there are other UI elements that were radically changed, I want to show a final example that only received a small change: chat. How you may think? When you look chat as an individual element, you notice there's irrelevant information that's being repeated. There's no need for chat to use brackets [ ] and show the full name of the channel. Therefore, it's toned down to a single letter. Remember, the users of my UI are experienced players, and once you've chatted once, you know "w" will mean whisper and "td" will stand for trade. [2. Trade] [Designit]: We will invite Caglar over. td Designit: We will invite Caglar over. Using recorded footage to make newer and better versions. In order to find new ways to improve my UI or see if it worked as intended for my users, I would ask them to upload videos of themselves playing. This became very purposeful because over time I learned my users weren't always able to articulate if something was wrong with the UI. Something very interesting would be if the users would modify the UI like remove some features or add some of their own. Because, if it's modified, is there something wrong with it? The users loved the UI. Wow that look amazing! Exactly what ive been looking for a couple of weeks. So clean. Mind sharing it? · Really like it, really does look clean · I love this UI · Hey, I absolutely love this UI, for all toons, but especially my healer. It's wonderfully clean and efficient · great work, slick as!! !· Hi, i just downloaded Ilive and i can just say that on the pictures i love it · Hey there. I love this interface. Very easy to set up and looks great. · Thanks for the great UI! · Hi iLive, thank you for a great Compilation · iLive, been using this s ince you created it. I love it. · Hey there iLive, just trying out your setup for the first time and so far I'm loving it · Ilive when are an update comming for 4.0.1 patch. I really really want to play with ur imba addon · Thank god, i was getting worried you had dissapeared · I gotta say, I love the UI. · Hi there iLive! First of all i must say i really love your UI package, its clean, its simple and its easy on the eyes · Great Interface · This UI is the best I have ever seen · Thanks a lot for the help iLive, really helped me out of a pinch there! Keep making your UI's look awesome and i hope you don't run into more tards like me . I didn't mean to embarrass you of course. I play very very casually and this UI has everything I need. It is lovely and clean. I am quite picky... but this one is it for me · I love it ! · using it now, and now its permanent <3 · I totally dig this. Please make support for 1440x900 resolution · love you long time · Well, I will be downloading this and using it this week. I've been checking your other thread and dying to try this out. · So you are still creating those awesome UI's of yours I see · Yes, your UI seems very clean… · Looks awesome, · Very nice UI, I am especially fond of the font and currently using it with Kripp's UI. · Hey there. I love this interface. Very easy to set up and looks great. · Looks nice, good job! · FINALY iLive · <3 love you so much thanks now i can play wow again .D · Just popping in to say keep up the good work · so far love the UI thanks.